In just three months, Madeline will be three years old. And just one month ago, only a few days after Christmas, she was diagnosed with Acute Lymphoblastic Leukemia. No family can ever truly prepare for hearing that their child has cancer. All they can do is look ahead to what’s next and what can be done to help. For Madeline and her family, that meant starting cancer treatment at Children’s Mercy Hospital in Kansas City. Shortly after beginning treatment, one of the nurses at the hospital introduced Madeline to a cuddly companion who would quickly become a member of the family. He was a Chemo Duck, given to Madeline to help explain the cancer treatment process in a way that would make sense to an almost-three-year-old child. Madeline took to him immediately and pretty soon he had a name: Scooter. Madeline has enjoyed getting to spend time with Scooter all day and all night. And she can relate so well to his port and tube because she has a port and tube, too! More than just the duck itself, Madeline has enjoyed getting stamps in her Chemo Duck passport every time she makes a trip to the clinic. When she’s not receiving treatment or cuddling with Scooter, Madeline enjoys painting her nails with her mom, playing with her Peppa Pig people and her dollhouse, or watching Sheriff Callie. We think it’s safe to say that Scooter is a welcomed addition to the family — and he will proudly provide comfort to Madeline and her family for as long as he is needed. 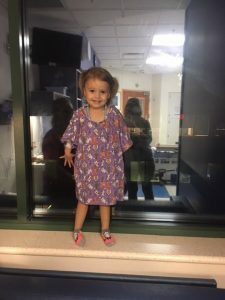 This entry was posted in Newsletter and tagged Acute Lymphoblastic Leukemia, cancer, Chemo Duck, Chemo Duck passport, chemoduck, Children’s Mercy Hospital in Kansas City, Gabe's My Heart. Bookmark the permalink.